If you are serious about IT security then this book is a must. Take the time to read it and try to understand the power of social engineering. There is no single technique in this world that can protect you against a good social engineering attack. 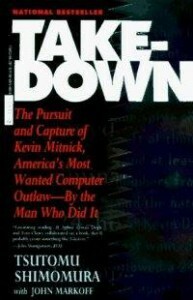 This book is written by Tsutomu Shimomura together with John Markoff and tells the story about one of the first well known “hackers” Kevin Mitnick. Especially the fact that Kevin Mitnick has good social engineering skills make him a pro in getting excess to secure environments. In an ever expanding world of networked mobile devices, security threats and our ignorance of them are more widespread than ever. James Lyne of security firm Sophos believes that if we continue to ignore basic best practices, security is on a trajectory of failure. A GCHQ team has been working to develop ways into encrypted traffic on the “big four” service providers, named as Hotmail, Google, Yahoo and Facebook. 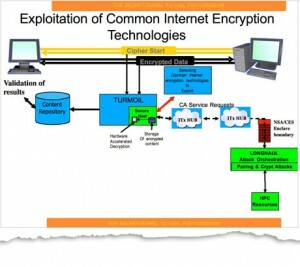 This network diagram, from a GCHQ pilot program, shows how the agency proposed a system to identify encrypted traffic from its internet cable-tapping programs and decrypt what it could in near-real time. If I think about it, what does this mean for the possibility that organized crime also has the opportunity to use these techniques. Then our whole eCommerce will crumble. Something to think about.